The muscles of the back of the thigh are called the Hamstring Muscles. These muscles take their origin from the Ischial Tuberosity in the gluteal region and run through the back of the thigh and get inserted into the upper end of the bones of the lower leg in the Popliteal Fossa. Each Hamstring Muscle is composed of four muscles namely Semitendinosus, the Semimembranosus, the Biceps Femoris, and the Adductor Magnus. They are placed longitudinally and almost parallel to each other at the back of the thigh. The main function is bending the knee joint. Since the Hamstring Muscle takes origin from the gluteal region, passes through the back of the hip joint, taking it's course behind the thigh and gets inserted into the upper end of the bones of the lower leg, the tightness of this muscle exerts excessive pressure on the low back which causes low back pain. 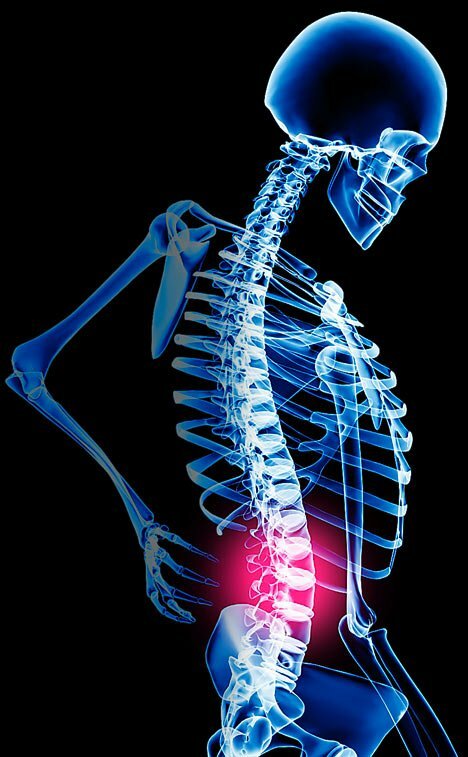 Once it is found that the tightness of Hamstring Muscles are responsible for the low back pain, proper exercises may be advised for stretching the Hamstring Muscles. The Hamstring Muscles stretching can be done in a long sitting position.The starting position of doing this exercise is to sit on a hard bed or floor with one leg flexed with the foot of that leg flat on the ground and that heel near the buttocks. The other leg, the Hamstring Muscle of which is to be stretched, is held in an extended position. Now slowly and gently bend forward. Reach for the toes with the stretched hand until a stretch is felt behind the thigh. Hold in this maximum stretched position for five seconds. Now the Hamstring muscles of the extended leg gets stretched. Repeat the exercise with the other leg. The whole exercise program may be repeated ten times. The flexed leg protects the low back by avoiding excessive flexion of the low back. 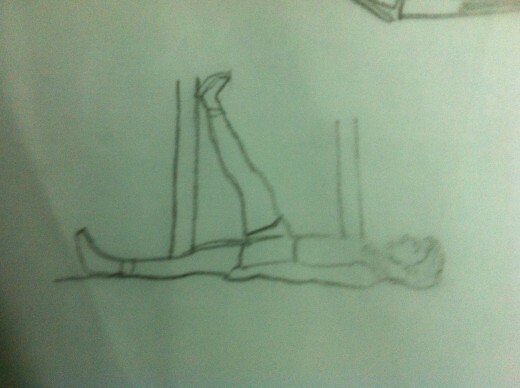 The Hamstring Muscles stretching can also be done in the lying position.Lie supine with your buttocks close to a door way.Keep one leg extended and flat on the floor and let the other leg rest on the door way. 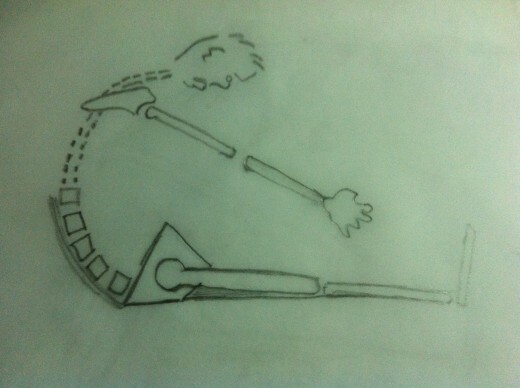 Now extend the leg on the door way by sliding upwards ( straightening ) till a stretch is felt behind the thigh. 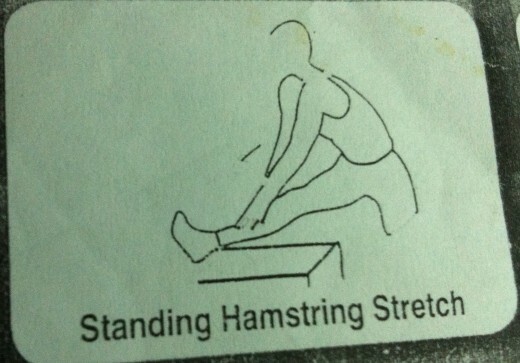 Hold this leg in this maximum stretched position.for five seconds. Slowly bring it back to the starting position. Repeat the same with the other leg. The whole exercise program may be repeated for ten times. The Hamstring Muscles can also be stretched in a standing position. The patient stand straight near a high stool facing it. The height of the high stool must have the same height as that of the patient's hip. The patient stands on one leg and places the other leg on the stool. Now slide the leg which is on the stool forward, slowly and gently, till a maximum stretch is felt behind the thigh. Hold the leg in the maximum stretched position for five seconds. Repeat the exercise with the other leg. The whole exercise program may be repeated for ten times. Stretching the Hamstring Muscles of both the legs simultaneously must be avoided. An attempt to stretch both the Hamstring Muscles simultaneously by trying to bend forward at the trunk keeping the leg straight ( either in the standing position or in the long sitting position ) may do harm and cause pain to the low back.Such an exercise is least effective as for as stretching the Hamstring is concerned. While doing the Hamstring stretching exercises if one feels a radiating pain down the leg, it may be because of the irritability of the nerve ( Sciatic Nerve ). In such cases, the exercises which cause the radiating pain must be avoided. 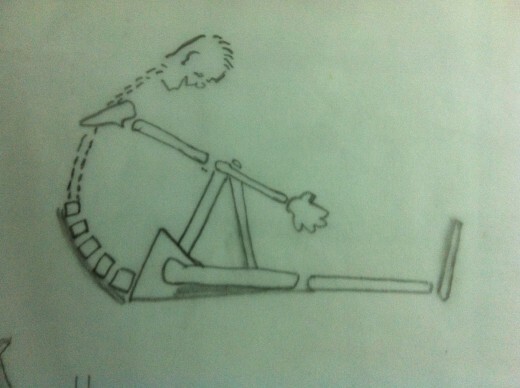 The stretching exercises must be done slowly and gently. " Bouncing " movements must be avoided. I never would have guessed that the hamstring muscle can be a cause of low back pain. Very useful. These stretches are great for lower back pain!